Offering you a complete choice of products which include parallel walking bar, walking stick powder coating c.r.c. (pips), quadriceps table, static cycle, grip exerciser and rotary wrist machine. 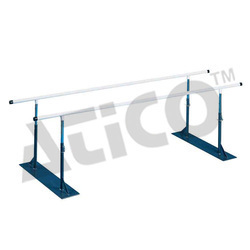 The length of Parallel walking bar with wooden platform is 3.75 meters,hand rail made of chrome plated steel tuning 1.5" outer dia. Outer uprights made of thick steel tubing (2" dia). Mounted on a wooden platform with rubber inclination settings. 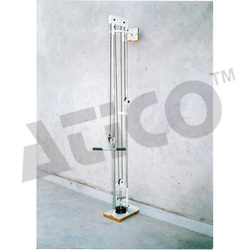 Height adjustable with rubber from 30" to 44" and width from 15" and 25" adjustment can easily to done by mean of setting pins at the required holes and can further be stabilizing by tightening the screws. Comes with detachable polished teak wood abduction board, which fits on the holes in the middle of the platform steel uprights and hand rails are painted. Walking stick made of aluminum or steel light weight folding type construction, just suits to pocket anodized colour finish provided with heavy duty rubber shoe. Frame Work: Frame should be made of 30mm / 35mm square tube of 16-gauge wall thickness. Overall size of the unit is 950mm×715mm×1370mm high. Oven baked finish. 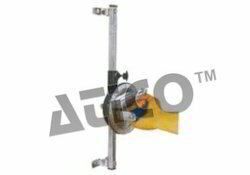 Torque Unit: Chrome plated torque unit should consists of two lever arms one be fitted with weight holder while the other with foam roller to provide contact with the patient Arms of square tube are calibrated for proper positioning of the weight & roller. Should have scale to measure the angle of rotation. Could be fixed on right or left side of the table. Seat & Back: Seat & back be padded with 35mm thick form & covered with good quality of Rexene. Size 550mm×610mm. Back should slide on chrome-plated pipes to adjust the distance from the seat. Accessories: Six weight plates of 1 kg. Each. Removable strap for thigh support. PU foam armrests. A plastic handle for arm exercises. Ruggedly built tabular steel frame stands on four rubber tipped property balanced legs provided with adjustable standard cycle seat specially designed adjustable handle fitted with one hard rubber tyre cycle wheel and standard chain and sprocket for cycle drive comes controlled variation in the riding effect odometer show speed and kilometer done oven baked paint finish. Rehabilitation machines are used for physical rehabilitation therapy. For grip strengthening exercises. 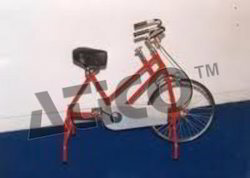 Frame: Should be made of 10mm ×4mm thick chrome plated steel strip with calibration on upper bar (0 to 4c) and outer frame should be fitted on 75mm wide × 250mm long laminated wooden base. 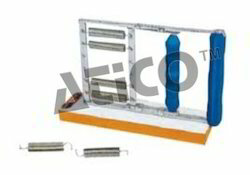 Chrome plated finished, metallic grip exerciser is fitted on a 50mm wide laminated base. Suitable for patients with very weak / infirm hand. Gives heavy resistance with six detachable springs. The upper bar is calibrated in centimeters and is provided with a needle to mark & record the daily progress. Also called "Supinator-pronator" and used effectively to promote pronation and supination of the wrist. Grip Unit: Unit should have single grip hold, precision machined Cast Iron drum, fitted with brake shoes for resistance and smooth plastic handle to grip. The resistance level should be measurable. Drum should also be fitted with a d dial protractor to measure the range of motion. 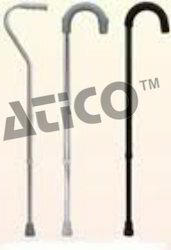 Wall Fixing: Unit should have wall-fixing arrangements with a 20mm chrome plated square tube of 50cm length to adjust the height of grip unit according to the need of patient. Finish: Grip unit should have oven baked black finish with working parts in bright chrome plated finish. 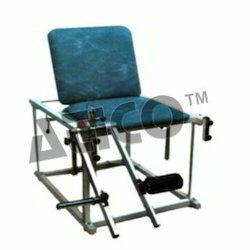 All chrome plated tubular steel construction mounted on the wooden platform and fitted with wall bracket at the top wall mounting comes with adjustable swivel pulley block a set of joking weight and two handles with nylon ropes suitable for all shoulder elbow and chest exercises confirming ISI specification. Rehabilitation machines are used for physical rehabilitation therapy. Looking for Rehabilitation Aids ?